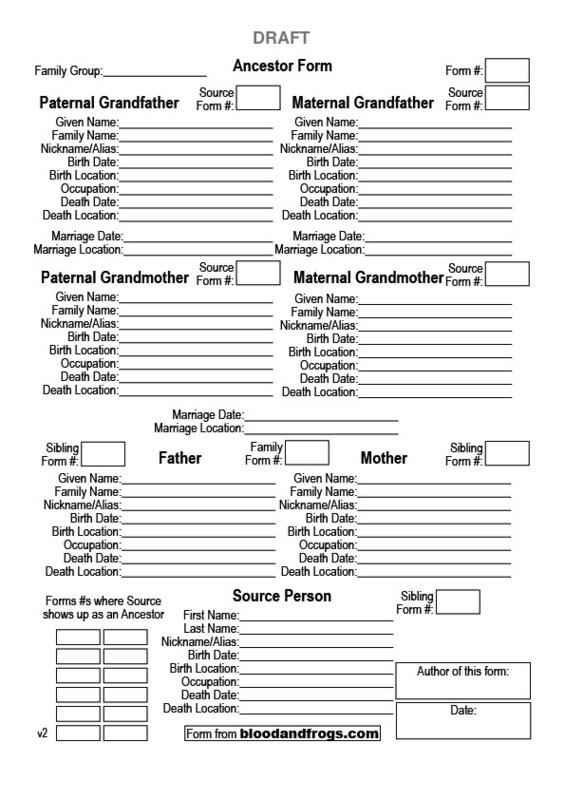 A few weeks ago I launched a series of genealogy forms I call the B&F Forms System. The forms page has received nearly 2000 visits since it launched just a few weeks ago, and while I don’t know how many people are actually using them, I have received some good feedback from some of those who have tried them out. I’m in the process of integrating suggestions from users of the B&F Forms System into new versions of the forms, and I want to go over what some of the changes will be before I finalize them. 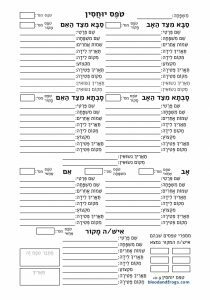 I think it’s important to get feedback on these types of forms, since so many people use them in so many different ways. Some changes are easy to make, and some more difficult. One reason I want to make sure everyone has had their say on the forms is that it’s relatively easy to change the layout of the forms, but it is very difficult to make them fill-able on the computer, so I don’t want to do that so too many times if I can help it. 1) I’ve added a box where you can add the Date you filled out the form. 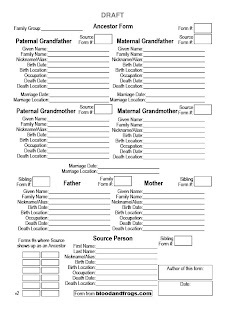 In some forms where there is limited space, I’ve merged this with the Author box, which is not ideal, but if you’re filling out the form on the computer there should be plenty of space for both the name and date. 2) Terminology is a funny thing. I started with First Name and Last Name which are the terms I generally use, even though I don’t use them completely literally. In the genealogy program I use, for example, it has you add both the First and Middle name if it’s present to the same field. This may be why I didn’t think about the First Name field being a problem. 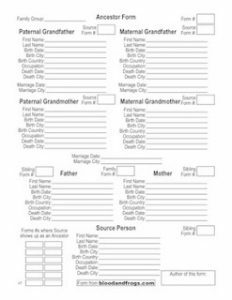 However, to keep the terminology consistent and accurate, I’ve changed the first two fields for each person from First Name and Last Name to Given Name and Family Name. Given name is intended for all names that were given to the person, and thus includes any number of names that precede the Family Name. There is room in the Given Name field for several names. 3) I’ve added a field called Nickname/Alias. This is especially important for people who immigrated from one country to another, where their names may have changed many times. This field can be used to add any number of variations and alternate versions of the person’s given name. For example, I have an ancestor who moved from Romania to the US and was known as Shubsa. On the passenger manifest of the ship he took to the US, he is listed as Schaps. In America his name was Sam. He was probably also known as Shmuel (the Hebrew form of Samuel) in religious settings. If you were to enter ‘Sam’ as his Given Name, then in the Nickname/Alias field you could enter ‘Shubsa, Schaps, Shmuel’. 4) In order to make room for the new Nickname/Alias field, I merged the Birth City and Birth Country fields into the Birth Location field. There should be enough room to enter both a city and a country in this field, especially if you fill out the form on the computer. For consistency I’ve also changed Death City to Death Location, and Marriage City to Marriage Location. These changes actually make the forms more consistent overall. Clicking on the image below will bring up a full page version of the Ancestor Form, which should illustrate the above changes. Changes on other forms are similar. If you have any comments on these changes, or think that other changes are needed, please post a comment and let me know. If there are no major comments, then I’ll get started soon making the forms fill-able on the computer, and then will update the forms online. Special thanks to Cathy Moulton for the Date suggestion, and Thomas MacEntee for the Nicknames suggestion and for pointing out that many people are hard to differentiate by just their ‘First’ name.